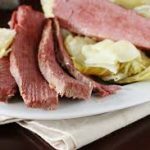 Once you've made this Home Cured Corned Beef you'll never want to go back to the commercial stuff again. Really great for a Reuben sandwich. Adapted from Charcuterie by Michael Ruhlmnan & Brian Polcyn. Combine the water, pink salt, sugar and garlic in a pot large enough to contain the brisket and brine. Combine the remaining seasonings in a bowl. Add half of these seasonings to the pot and reserve the rest. Bring the water to a simmer, stirring until the sugar and salts are dissolved. Remove the pot from the heat and allow to cool to room temperature, then refrigerate the brine until it's completely chilled. Place the brisket in the brine and keep submerged and refrigerated for 4 days. Remove the brisket from the brine and rinse it thoroughly under cold running water. Place the brisket in an appropriately sized pot - not so big that it will float in too much water, but not squeezed in against the sides - and fill the pot with water to cover the brisket. Add the reserved spices along with 1/4-ounce or 1 1/2-teaspoons of salt per quart of water. Bring it to a boil, then reduce the heat, cover and simmer gently for about 3 hours, or until fork tender (there should always be enough water to cover the brisket; replenish the water if it gets too low). Remove the brisket from the cooking liquid (which can be used to moisten the meat and vegetables, depending on what you are serving), slice and serve warm. !Pastrami: For an excellent variation, you can turn this corned beef into home-cured pastrami by coating the brined but uncooked brisket with a mixture of equal parts ground coriander and ground black pepper and smoke-roasting it slowly in a kettle grill or home smoker or grilling it over very low indirect heat, including smoky wood chips and covering the grill. Steam it till it's tender for hot pastrami.